2k Erg Rowing Test – The January 2011 Experiment. 1 – Super Quick Hands. You can never be too quick with moving your hands away from the finish of the erg rowing stroke. Not only does it help rhythm and power towards the finish, but if done correctly it can really set you up for the next stroke by recycling some of that dynamic energy built up during the power phase. Use the speed and energy of your hands away from your body to swing your body over the hips. A lot of Ergers make the mistake of not moving the body past vertical in the recovery phase. 3- Lift your knees smoothly. This is especially important if you are a rower. Most of the time rowing Ergers will really emphasise the separation of the hands, body swing forware and slide on the recovery phase. That’s fine if your game is proper rowing technique. But on the erg this is a waste of time and energy. The idea is to keep recycling the energy dynamically. If you delay or make a sticking point along the stroke cycle then it’s just wasted energy. 4 – Be set up and ready for the power phase. Once your seat wheels are on the move towards the beginning of the stroke you need to be thinking only of one thing – the next stroke. Most rowing coaches will call this heresy but they are looking at it from rowing-a- boat perspective. Ergers are looking at it from the fastest possible erg perspective. 5 –Take it easy on the easy phase. When it’s easy make it easy. In other words when you are going up to take your next stroke allow yourself to take it easy. Taking it easy doesn’t mean taking it slow. RELAX. If you can learn to relax then you will save A LOT of energy. Even by just by thinking ‘easy’ makes the blood flow and mind feel strong. 6 – Use the easy phase to make the power phase easier. 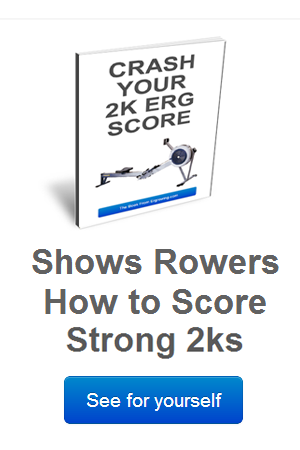 This is one of the most important tips you will read at erg rowing.com Most rowing coaches will never mention it because they don’t even know it exists. Most average rowers don’t know about it. The top Ergers however DO know about it. You won’t see it by watching YouTube. You won’t even see it at the CRASH B’s. It’s so imperceptible that it’s almost invisible. You just have to know it exists, find it, feel it and use it. I’m talking about recycling dynamic energy. If you find it you can save unbelievable amounts of energy and when you get the feeling you won’t let it go. To find it you need to approach the beginning of a new stroke with perfect speed. It’s a very subtle feeling. A lot of rowing coaches will say that you need to slow down the seat as you go for a new stroke. Recycling dynamic energy demands that you actually maintain your seat speed or slightly faster. When you do it correctly and you hit the next power phase you will feel a reduced load with the same split or even lower. I don’t have percentages, because I can’t measure it but take it from me, once you can hit this sweet spot, you will save yourself a lot of pain. Remember recycling dynamic energy. Another way of thinking about it is to keep the wheel spinning. Feel as though you are tapping the wheel along. You are not ‘muscling’ the handle on the power phase. Recycling dynamic energy is closely related to rating which I examine below under rating. 7 – Sequence your power phase. If you can dance (well! ), then you will know that sequence and timing is crucial. Similarly the power phase of an erg stroke is all about sequence and timing. Strongest – Next Strongest – Weakest. Legs – Back – Arms in that order. Simple, yet it’s absolutely the most efficient and effective way of pulling the handle. To get the most from this sequence you need to follow the advice in the next article very carefully. Best Erg Footplate Position – A Definative Answer. Over 1 Million times a day, people search google for “correct erg footplate position” or “best foot plate on the erg”. Ok I’m exaggerating by approximately 999,997. But you will be surprised about how many ergers and rowers do not set the footplate position correctly on the erg. Did you know that the correct footplate position can make a massive difference in power and technique? So what is the best foot plate setup? The goal is simple. You need full length sliding and maximum power through your feet and legs. Full length is vertical shins at the beginning of the power phase. Most people either over-compress or under-compress and neither is good. And unless you have a mirror or a good coach beside you, it’s impossible to tell if your shins are vertical at the catch. So get some help. But there are more factors you need to consider to ensure a good erging foot plate position. Taller people generally have larger feet and need to position the footplate low (with maybe 1 or even zero holes showing). Otherwise their toes and balls of their feet would be overhanging the top of the footplate. Which is and a big waste of power and a definite short slide maker. Smaller shorter people generally have shorter and smaller feet. If you are like below 6 ft you need to put your footplate higher up (with 2, 3 or even 4 sets of holes showing). Because you are not in an efficient position to gain maximum power from your leg drive when your feet are too low. Plus it’s a mechanical certainty that you will open up too early with your body-swing on the power phase. Which means a weak acceleration to the finish of the stroke. 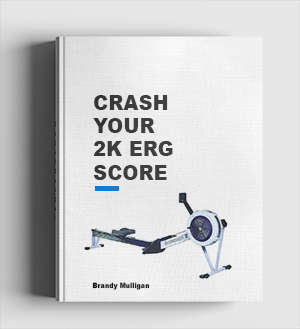 Next time you are erging, try it out. Set your feet lower than you usually do and you will find that it feels really weird. You’ll discover that it feels like you can row a lot longer and getting to the catch is a breeze. But on the erg, longer is not always better. If you are under set with your feet and you are over-compressing at the catch there will be a delay in getting your legs fired up. And you will accumulate more lactic acid (pain – which we don’t like!) because of the acute angle between your upper and lower leg. A good footplate position should allow you to power up easily and horizontally. The best way for you to pull the handle is in a straight line – as close to your strong levers (legs, back and arms) as possible. Weightlifters do it all the time. Have a look on YouTube for some Olympic Weightlifting techniques and pay attention to how they all emphasise the bar remaining close to the body as much as possible during the lifting phase. Ok rowing is different, but not all that much. You gotta keep that handle straight and close to your body as much as possible. Otherwise it’s like trying to stretch out at full reach and pick up your grandmas favourite (and really heavy) ornament from her mantelpiece. A dangerous move and not guaranteed to give you a result! The Proportion between your legs and back. If you think you are in this category you need to fix your footplate high. Even if your feet overhang a little. Because there will be too much of a gap between your handle and feet. Your Hip and Ankle Flexibility. You might have ankle, achilles tendon, knee or hip flexibility problems which might prevent you from rowing at full slide length. In that case you need to drop your feet low (at the cost of being more ii) because good length is more important than maximum efficiency. The bottom line is keep the footplate as high as possible, without overhanging with your toes and balls of your feet. Without being so restricted that you cant even get past half slide with your seat. Strapless Erging Will Fix Excessive Lay Back. 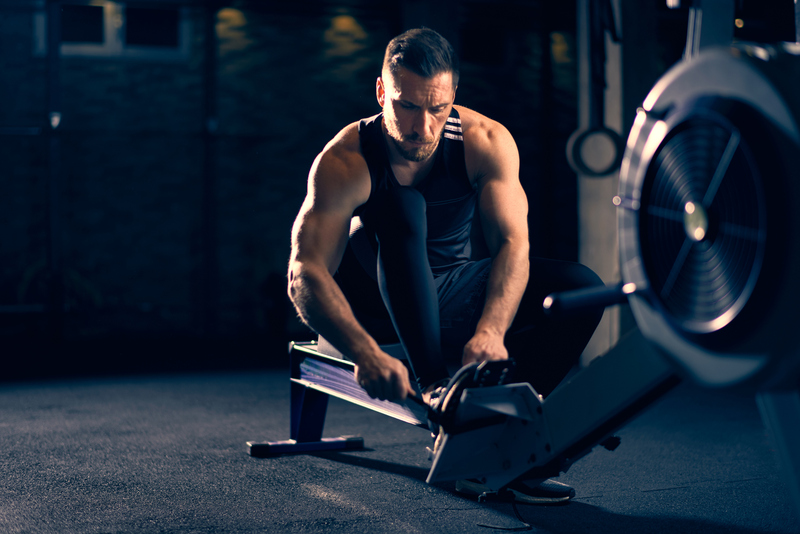 Sit on the erg and pull a few light strokes without putting your feet into the straps. Most who try this for the first time end up falling back off the seat as their feet rise from the foot plate. And Ergers who have excessive lie back usually end up on the floor! The first secret to successful strapless Erging is timing. You must aim to finish your legs back and arm power phase at roughly the same time. When you do well, your natural lean back angle will be at about 2 o clock. When it is done very well, your chest and core open up and your shoulder blades almost pinch together at the finish. The upshot of this is that it allows your lungs to function very well. Point your toes and straighten your legs. The second secret for successful strapless Erging is to keep pressure on the foot plate at all times – especially at the finish of the stroke. When you first try this you will really feel as though you are cutting the power phase short by about a third. For while it will feel counter intuitive, but stick with it. I always begin my workouts with a couple of minutes warming up with strapless feet. And when I go back to normal feet, the difference is amazing. Work on your core. Lots of excessive layback is caused by default – weak stomach muscles and core. Engage your core during the power phase to brace yourself and use it to prevent laying back excessively. Low Pull or High Pull? If you Erg with a long lean back you must pull high because otherwise the handle would end up somewhere below your waist! The most efficient path for the handle to travel from the start to the end of the power phase is in a straight line. And as level a handle as possible. Imagine looking at yourself from the side when you are on the erg. You can see the handle moving perfectly parallel to the floor around and around in a smooth cyclical rhythm. More often than not the handle is drawn in too high. This is caused by too much arm pulling at the finish. If you have this problem, think about powering up early in the stroke and releasing the handle early towards the body in a smooth horizontal motion.